For the past eight years Miriam Black has been able to determine how and when someone will die—down to the exact second—just by touching them. The visions only happen with skin-to-skin contact, and she sees them only once. Though she has witnessed many future deaths of those around her, invariably, she cannot see her own. Finally escaping her traumatic childhood, 22-year-old Miriam drifts from place to place, targeting mostly men whose number will soon be up. Once her marks expire, she empties their wallet and moves on to the next town. Both a blessing and a curse, her powers allow Miriam to use them to make a positive difference—if she so chooses. Attempting to be helpful, she sometimes tells people about their eventual finality, but more often than not, she is met with distrusting stares and violent reactions. On most occasions, she wonders if her mere presence is actually the cause of an other person’s otherwise arbitrary demise. Miriam keeps a journal of each incident she witnesses, a journal in which ten blank pages remain. Longing to have peace from the guilt and persistent nightmares, she makes a deal with herself: once the tenth page is filled she will end her suffering; however, she doesn’t count on meeting two very different men: Ashley, who will attempt to plunge her deeper into the darkness; and Louis who just may save her life—although, as a result of her actions, she’ll have to save his first. 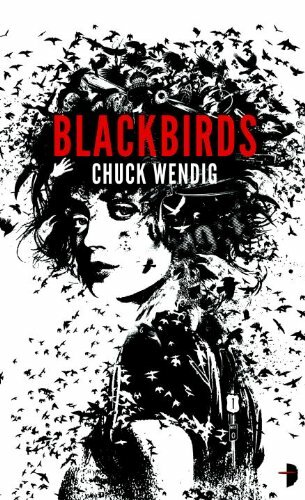 Author, screenwriter, and writing advice guru Chuck Wendig creates a compelling tale with an even more compelling protagonist in Miriam Black: a tough, street wise survivor who finally escapes her troubled childhood only to find that she can’t escape herself. Despite her fairly macabre lifestyle, Miriam has a strength and sarcastic wit that makes her very likeable and strangely sympathetic. Mr. Wendig skillfully shows the various sides of the multifaceted Miriam in the way he structures the perfectly balanced dynamics between her and her main men. In addition to a cast of well developed yet mentally unstable characters that enhance a fantastically horrifying plot, Blackbirds possesses a natural progression that doesn’t rely on convenience or contrived circumstances to move the story forward. Author Wendig’s distinctive, straightforward style is accessible and insistent; and the generous helpings of violence are strangely invigorating. Chuck Wendig has raised the bar of the urban fantasy genre and introduced a dynamic new character who, if left to her own devices, will most likely steal more than just your heart.